There’s a potentially habitable planetary system just 14 light-years away from Earth — a big distance, sure, but just a stone’s throw away in cosmic terms. 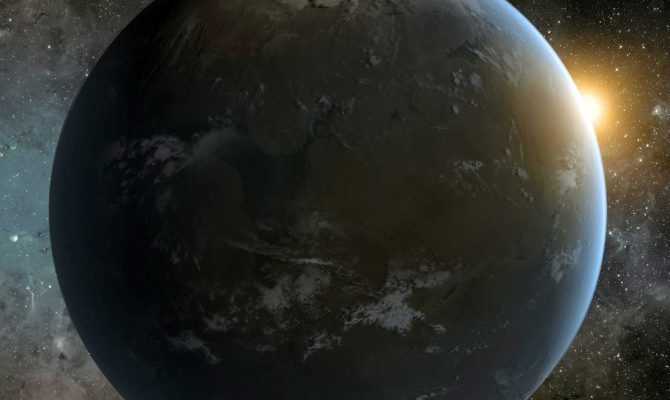 It hosts a planet that’s surprisingly similar to Earth — raising high hopes that it could be potentially habitable to life. When many people think about potential nearby planets that could sustain life, Proxima b comes to mind. Orbiting nearby star Proxima Centauri, Proxima b is just over four light-years away from our planet. Its discovery last year sent shockwaves through the astronomy community. But a star called Wolf 1061 is just a bit further, and it has three super-Earths in its orbit. A team of researchers have been hard at work conducting in-depth studies of this planetary system, and are about to publish their new findings in an upcoming issue of The Astrophysical Journal. “The Wolf 1061 system is important because it is so close and that gives other opportunities to do follow-up studies to see if it does indeed have life,” San Francisco State University astronomer Stephen Kane, who led the research team, said in a news release. When scientists look for planets with life, they look for a planet with similar properties of Earth, meaning that they orbit in a zone that’s perfect for life. If it’s too close to the star, it will be too hot to sustain life. But if it’s too far, it will be too cold. That’s why it’s sometimes referred to as the Goldilocks zone. One of the planets in the Wolf 1061 system, called Wolf 1061c, is rocky and is within the “Goldilocks zone.” Unfortunately, it resides on the inner edge of this zone, closer to the star — so it might instead have an atmosphere that’s more similar to Venus. What he means by “runaway greenhouse” is that some scientists believe Venus once had oceans, but the planet became so hot that the water evaporated. The water vapor made the planet even hotter, further exacerbating an increasingly inhospitable environment. Wolf 1061 is an M-dwarf star, which means since it’s fainter, it takes longer for biochemistry and life for emerge. Also, the planets in the system seem to have elliptical orbits, rather than circular. And since the three planets of the system are so close to each other, they affect each other’s orbit. This means Wolf 1061c’s orbit changes at a faster rate. Unlike Earth, the changes in climate are probably much more extreme and rapid — for example, the planet might often freeze over or heat up. It’s possible that Wolf 1061c might contain life — but we won’t know for sure until we’re able to study it with better technology. Hopefully, Kane and his colleagues’ findings persuade the astronomy community to develop more advanced instruments to investigate the planet and others like it in better detail.